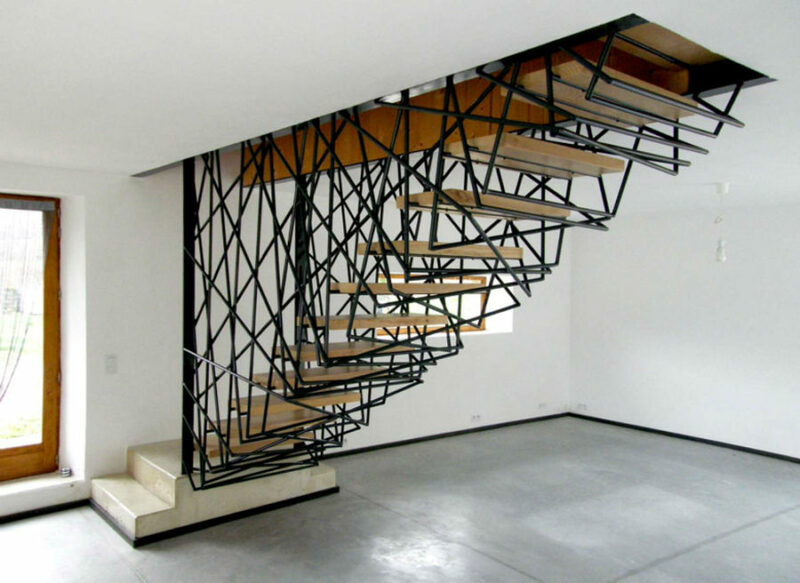 Staircase designs are as complex and versatile as any other architectural elements. 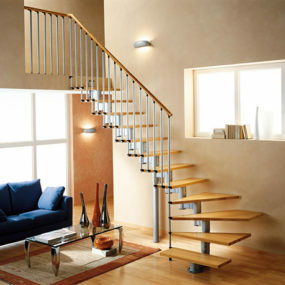 Modern stairs have changed shape and form of not just railings and general structure but the steps themselves. Now any combination of form is possible. Any curve is encouraged. 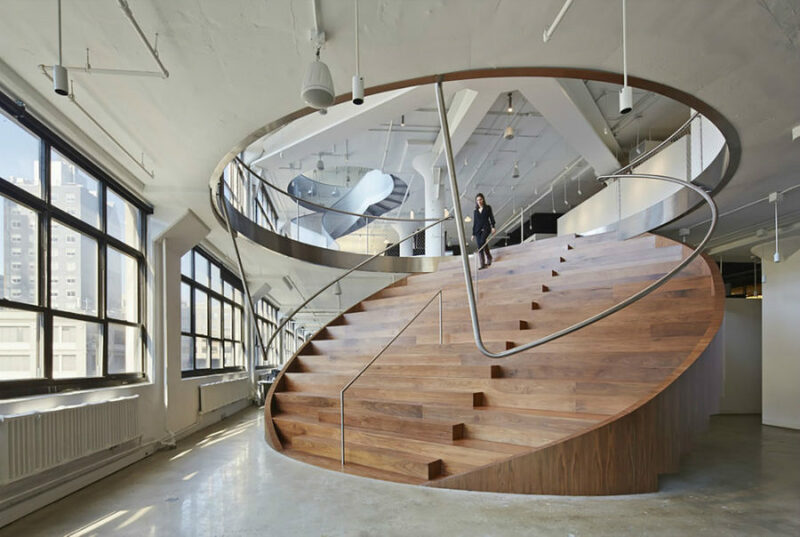 You can find all kinds of inspiration from these stairs that look more spectacular than the buildings they live in. 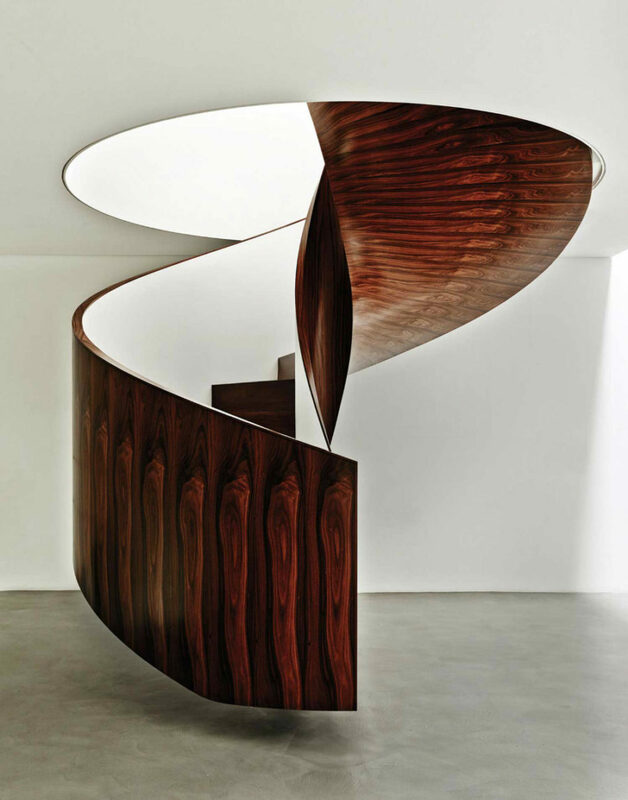 The first thing you may notice about this staircase is its contrasting Brazilian ironwood body that gives it a look resembling that of a snail shell. Architect Isay Weinfeld incorporated this beautiful spiral element into a contemporary minimal house in São Paulo, and it definitely became a crown jewel of its interior. 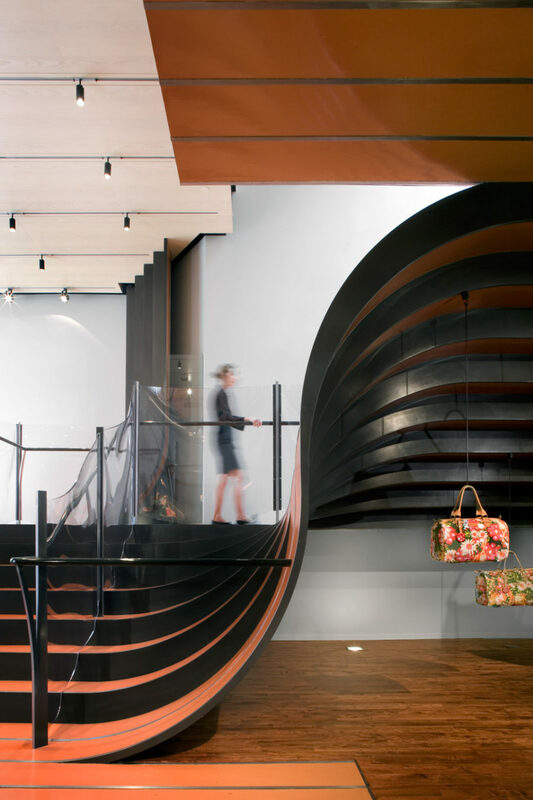 When designing a store for the British brand Longchamp, Thomas Heatherwick and his team of designers came up with a design solution for an unconventional space that had little square footage on the ground floor. 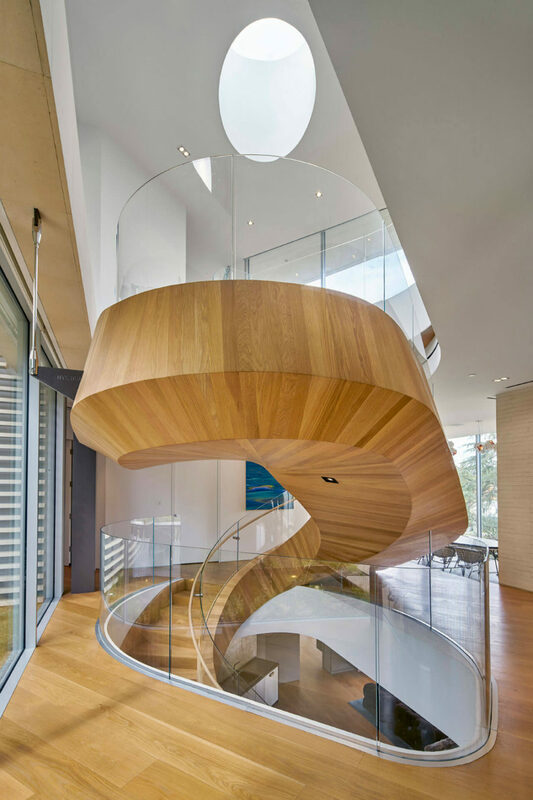 Creating a waved landscape incorporating a staircase, the architect managed to bring more daylight to the ground floor, while creating a natural transition between floors. 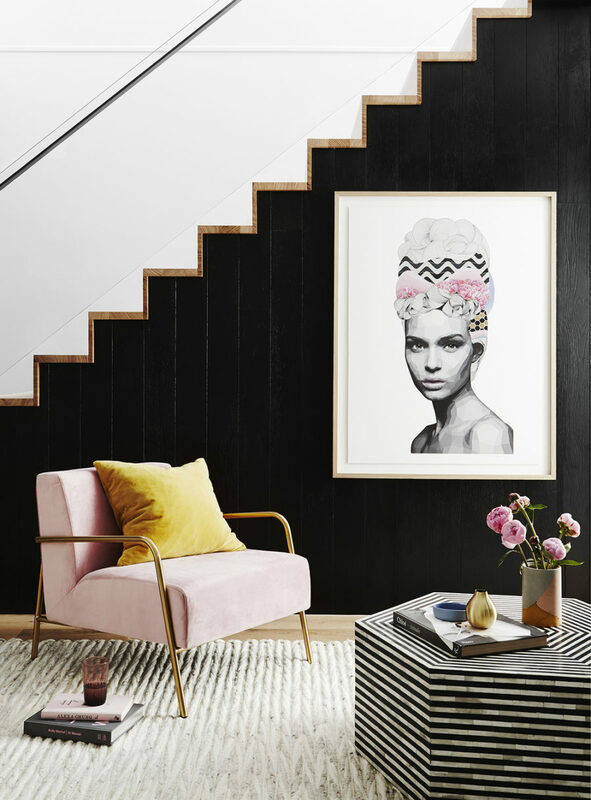 When we talk about how staircase designs have changed throughout decades, we ultimately come down to vertebrae, as it’s one of the best shapes for a contemporary staircase to take. Inspired by a spine of a whale, Andrew McConnell created a design concept that would fit right in with one of Zaha Hadid’s buildings. The latter was known for her affinity for vertebrae form. 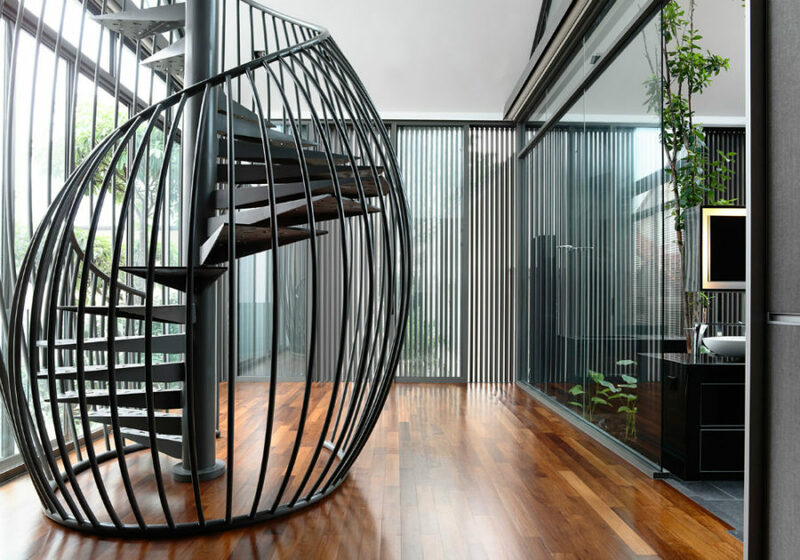 Converting a semi-detached house to a bungalow, HYLA Design connected a master bedroom and a study with a sharp spiral staircase that they enclosed in a curved metal railing to create a safe and designing interior element. The staircase gained much prominence thanks to this bulging railing, and it also corresponds well with the exterior louvre system. 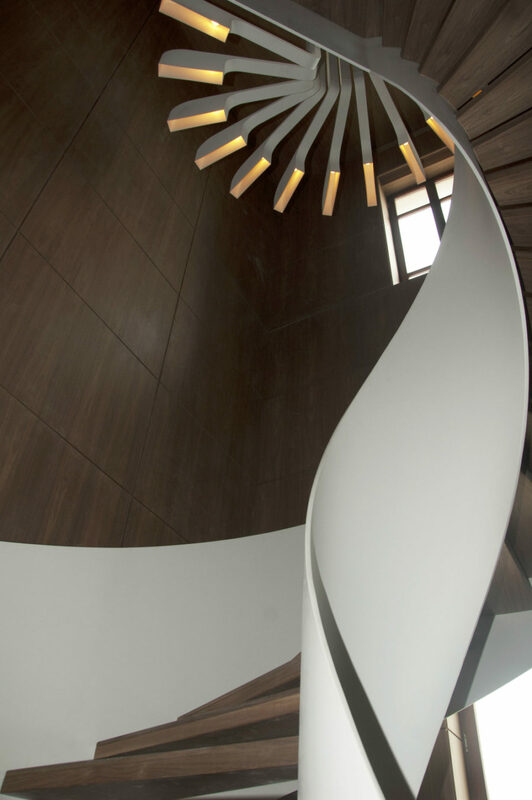 This spectacular petal-shaped staircase was designed for a private residence in Kuala Lumpur full of designing elements with this masterpiece as a main attraction. Each and every step is carefully designed to create a breathtaking look from above unobstructed by any solid railing. 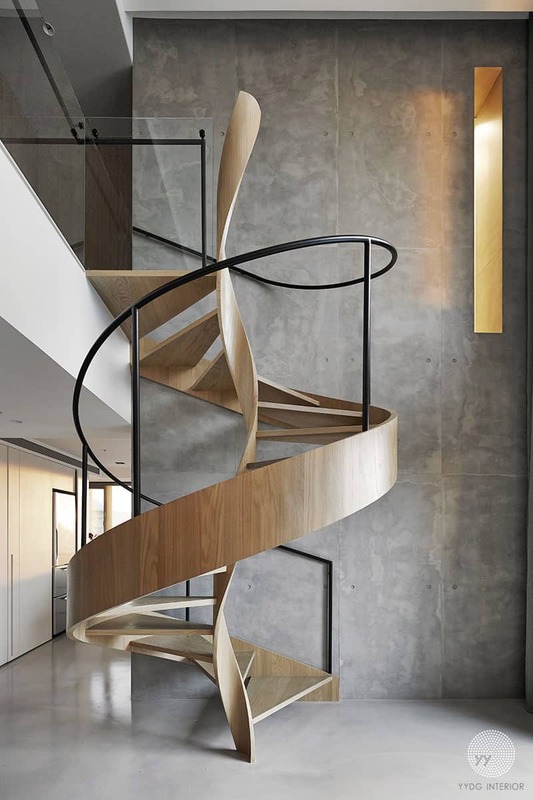 When we look at this sculptural spiral staircase, we’re reminded of a tiny little ribbon bow that is like a finishing touch on the minimal contemporary box of a house that it is located in. Designed by YYDG Interior the wooden beauty brings plenty of warmth and contrast to the concrete and stone living room, and matches well with the mezzanine level room entirely clain in wood. Located in L.A. the Tree Top Residence hides a big secret within its layered angular architecture. 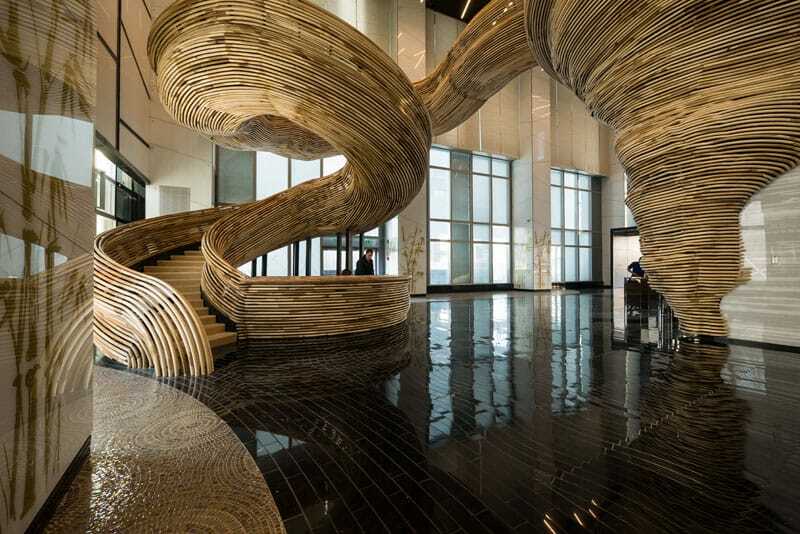 A grand spiral staircase made of the same wood as flooring waves and wags taking residents from one area to another. The staircase is enclosed in a smooth plastic-looking railing, thus resembling a snake that’s raised her head above ground looking for a prey. In modern architecture not all staircases serve their direct purpose of transitioning from space to space. At times they are simply there for decorative purposes, other times they are meant to be places of their own. Take this one, for instance. Paul Cocksedge designed a Living Staircase for Ampersand Building in London to provide people with plenty of room for relaxation, thinking, and rest. 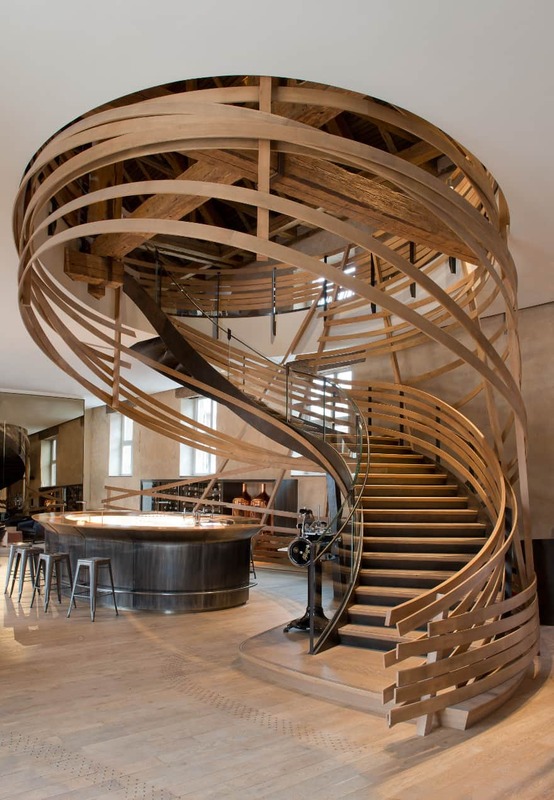 Another beautiful modern staircase from Jouin Manku comes wrapped in bent wooden strips that resemble a barrel in Les Haras brasserie in Strasbourg. Occupying the former Royal Stables, the place had its limitations, but the talented architects managed to find a place for this grand architectural element that makes the brasserie immediately stand out. 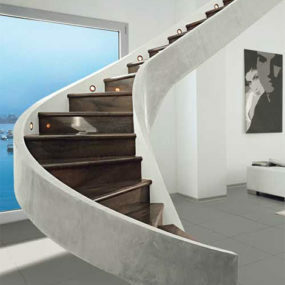 Modern materials allow staircase designs to be very different and unusual. 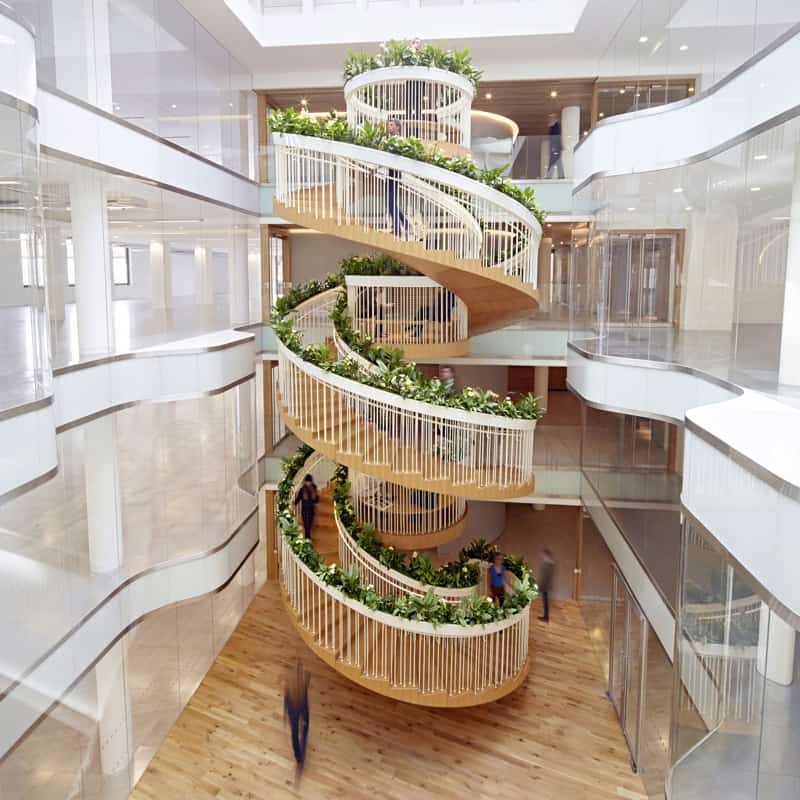 The spiral staircase in this Tel Aviv office tower takes a step into a different direction with Poplar wood, which gives the contemporary glossy building a huge dose of natural beauty. Comprised of two elements – staircase and a balcony – the installation looks especially interesting thanks to the irregularities and peculiarities of wood. 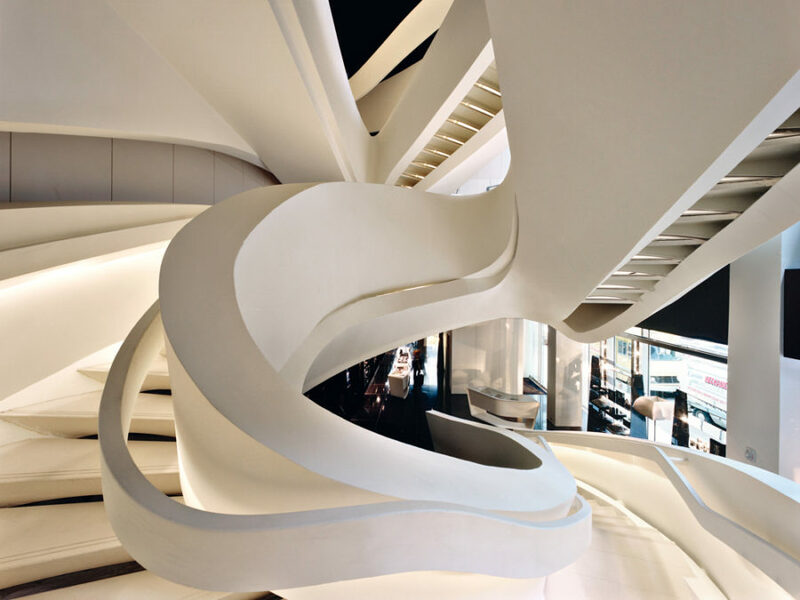 The staircase in Armani 5th Avenue store is the pinnacle of contemporary design. Part futuristic and part minimalist, the elevation is writhing and spirling in complex details that become the store’s main attraction. Contrasting with the dark sleek interior, the stairs utilize a great ambient lighting system that illuminates each and every element in its design. 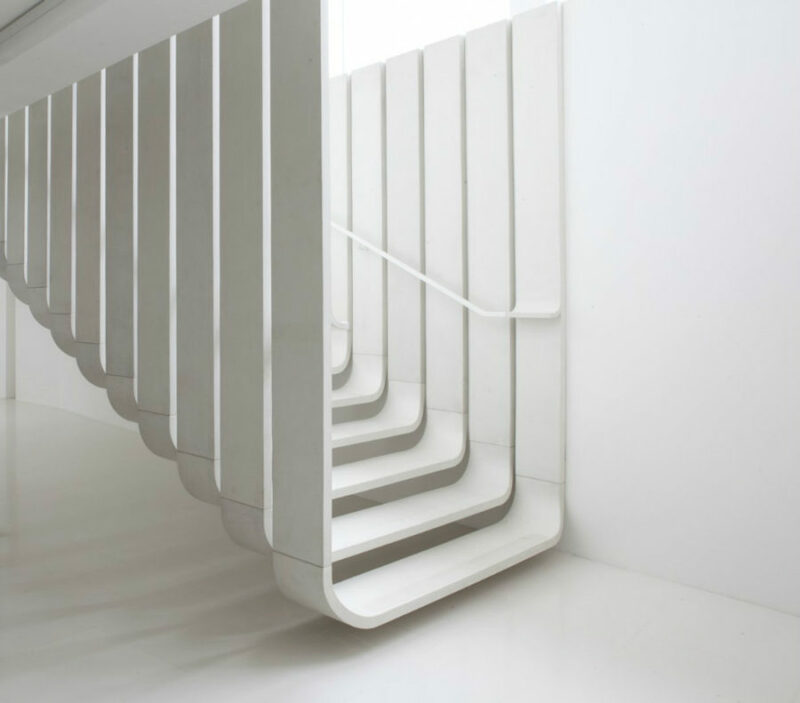 Redesigning a London house for fashion designer Roksanda Ilincic, RA Projects added a blue steel staircase to the pristine white interiors, but it not only became a bold architectural element in white interior but it also brought additional storage space with it. While the sides of the staircase are protected with walls, the back is outfitted for a home office storage, a small library, or a tableware display. 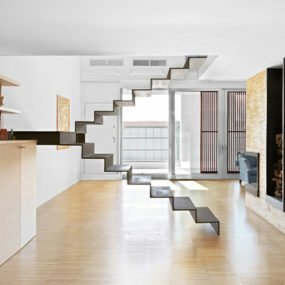 Biljana Jovanović has designed this creative staircase for a young family home in Budapest. 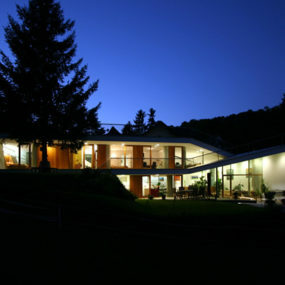 The house architecture called for something sleek but designing, so the result is quite fitting. Aside from the perforated staircase walls, there are angular steps that create a crisscrossing pattern when looked at from below. 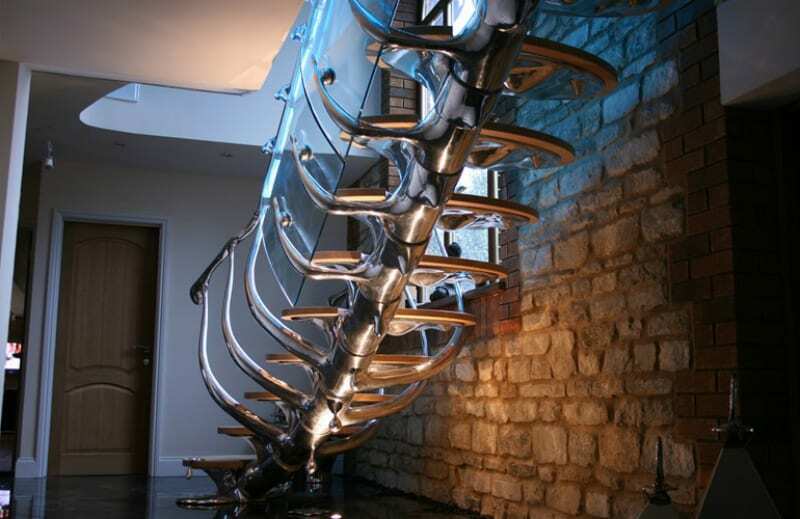 This is one of the most intriguing staircase designs you can find on the web. 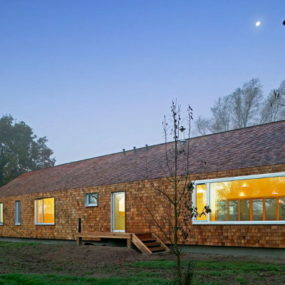 Conceived by Eestairs, it would make a grand addition to any contemporary house. 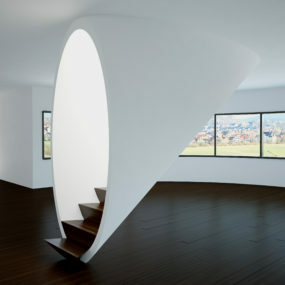 We like the contrast between the white oval structure and smooth brown wood steps. It looks especially beautiful in concert with the matching interior. Berlin interior design studio Hidden Fortress created a suspended boxed-in staircase design for a Bazar Noir concept store. 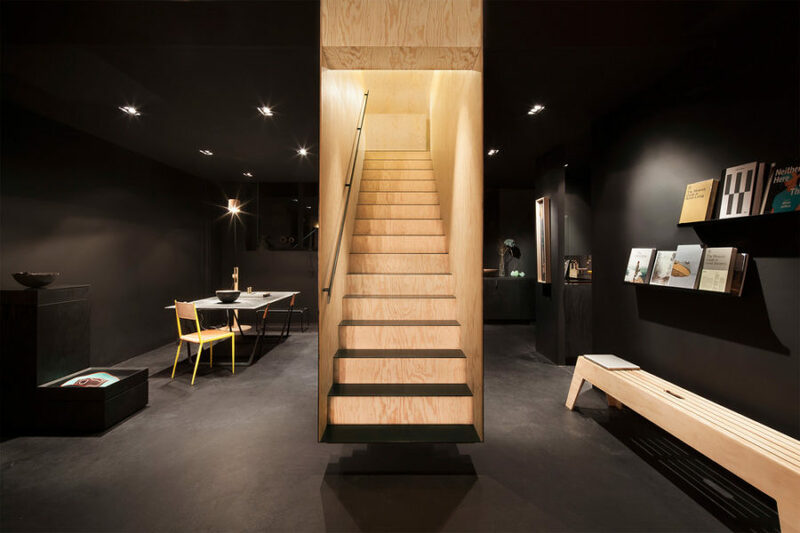 The wooden interior of the staircase structure presents a sharp contrast to the black grey store interior. We love everything about it! Floating Staircase by Zaha Hadid is an incredible affair, as per usual. Designed in a succession of continuous steps that also form the stair railings, this staircase is made for the office or a store. Elegant and sleek have always been the signature qualities of Zaha Hadid’s designs, and the Floating Staircase is no exception. Villa La Roche is a seemingly traditional building, but when you step inside nothing can convince you that it is indeed so. Pristine white walls, sparse wooden elements, and a complex staircase design make it as contemporary as it can be. The staircase would be a series of wooden floating step was it not for a chaotic metallic encasing that gives it such an interesting look. 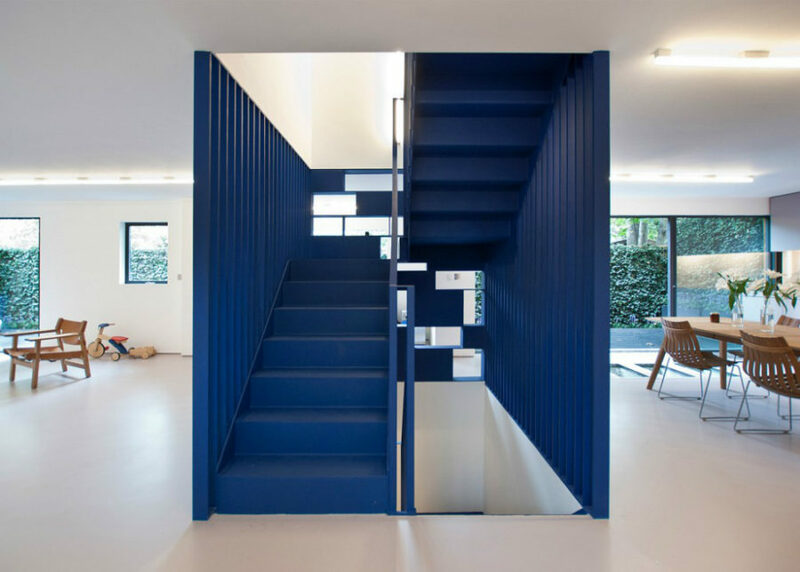 Rarely do we see unique staircase designs that use traditional materials. Peter Marino Architect fills that niche with his breath-stealing works. 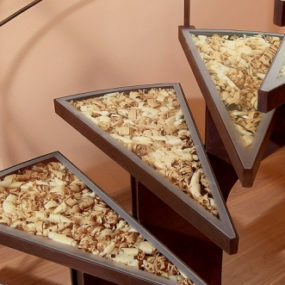 His Bulgari London store staircase is not only gorgeous, but it is also representative of the store’s luxury contents. 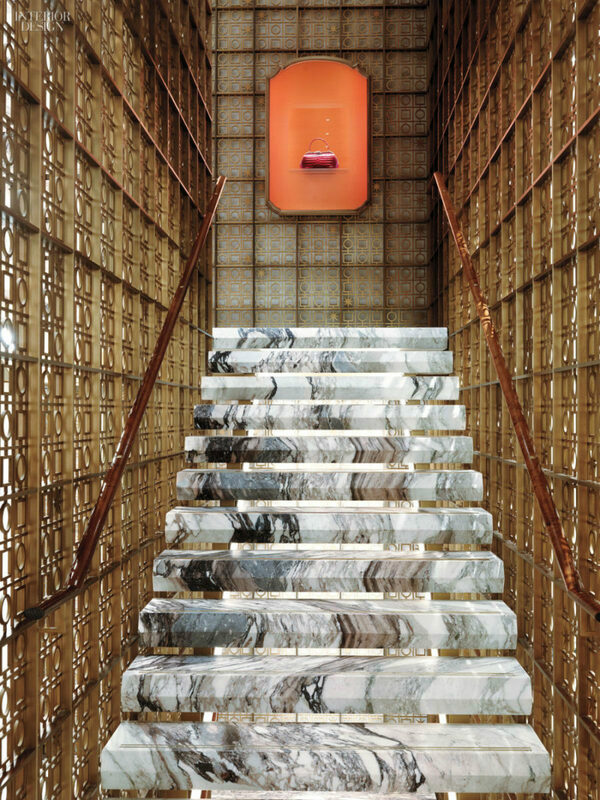 Its screened walls and lush wooden rails are a beautiful frame to the floating black and brown marble steps. 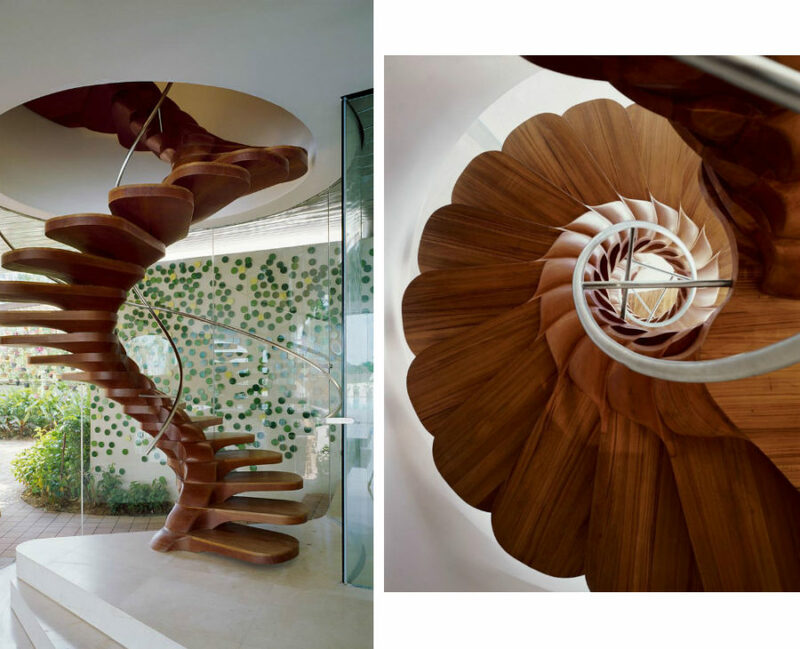 Instead of separating from the interior as a freestanding element, this organic staircase design connects and links to the walls and to itself like a part of a living organism. Its railing creates a sitting nook where you can lean back and read a book or do some work. 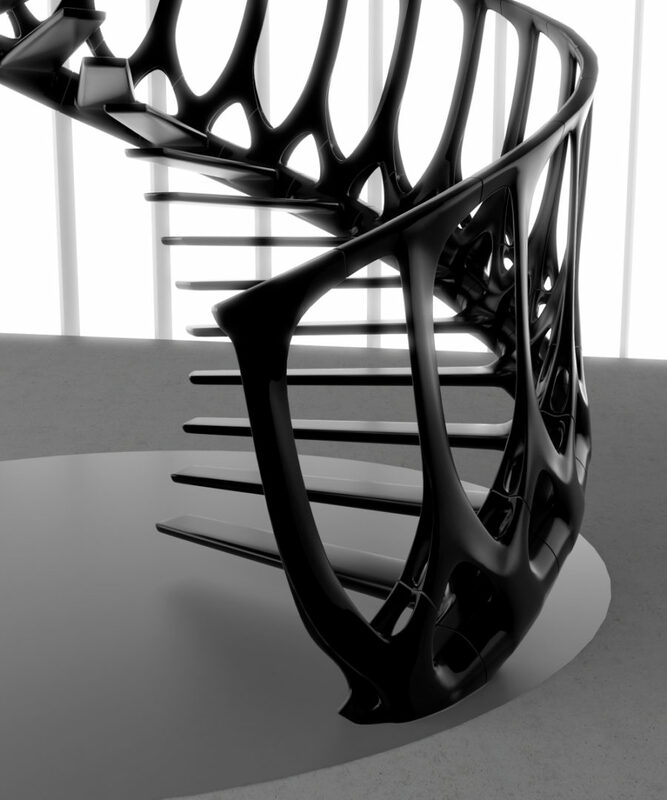 Philip Watts presents another vertebrae-inspired staircase design that would make a rather bold accent in a modern home. Metal structure gives it an especially edgy feel, though the timber steps soften the brutality and coldness of an edging, curving metal. WORKac took the approach of “a minimal compression of individual work spaces that opens up room for a gradient of diverse collective spaces” and gave it a solid shot. 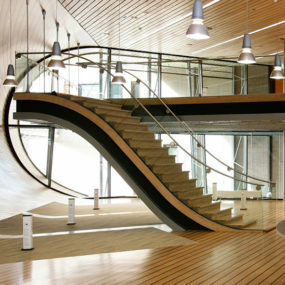 The resulting round staircase is not just a mere design element, it is also an informal meeting space. Kuadra Studio made a statement staircase for the bank office in Caraglio, Italy. Its steps, that come in linked pairs, are built into a wall but appear levitating in the air. It also has a suspended railing that doesn’t look connected to the steps. And its ambient wall light provides the descending with safety and enhanced vision. 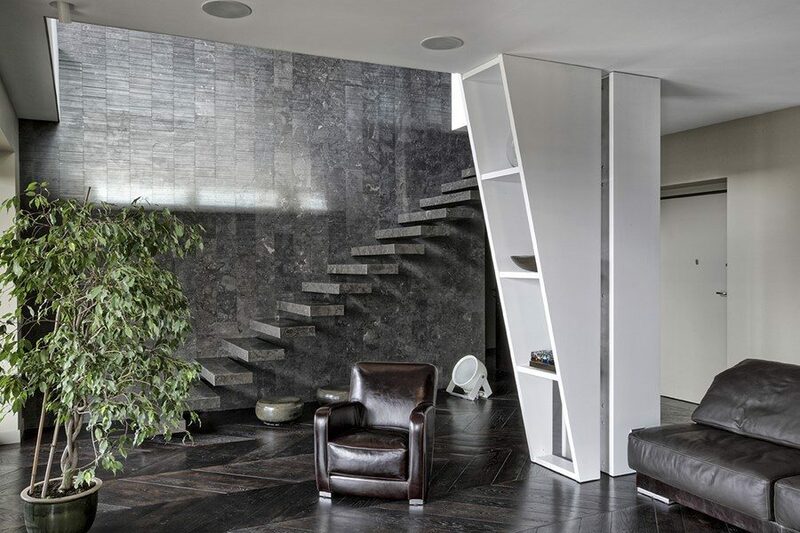 MG2 Architecture built a floating staircase for a project in Italy. The stone steps are made of the same material as the feature wall they are attached to. The effect is both dramatic and coherent. And we cannot help mentioning the support column design with the built-in shelves, as it’s simply amazing. 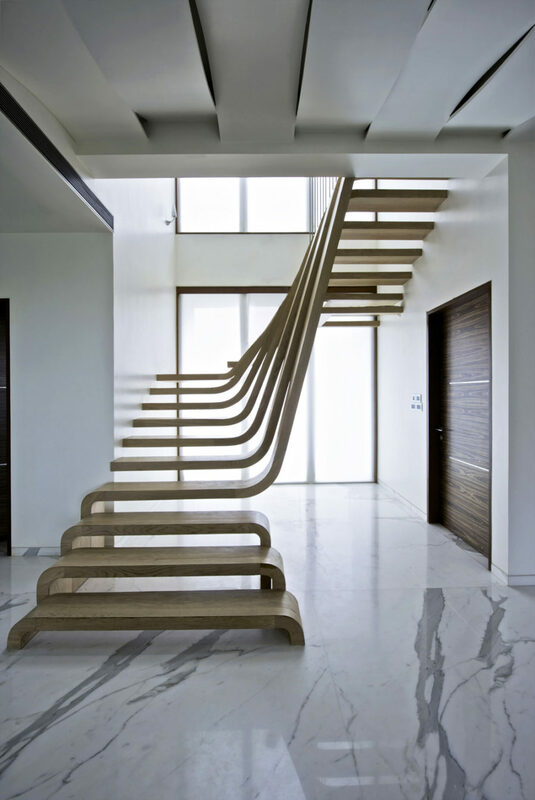 Not all staircase designs must be dramatic. Some can be as common as this one. But even it has a great element to it – color. 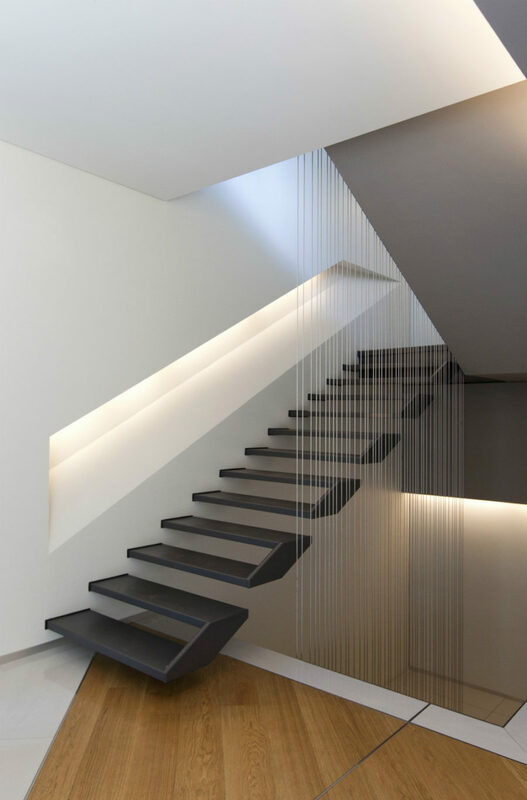 The black under staircase wall looks beautiful in contrast with the white interior. A minimal transparent railing somehow adds to this entire design, and the wooden steps create attractive accents in between. While .PSLAB’s Residence Staircase is a great design of its own, it is the matching chandelier that gives it all the drama. Following the elegant staircase shape, the lighting fixture allows itself more detail. Together they look especially gorgeous. 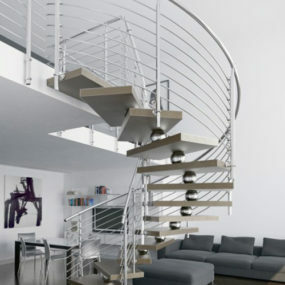 Modern staircase designs are often cool and unusual. And they don’t always need size and scale to look dramatic. Today, you don’t need a special area to make a staircase grand either. So get inspired and start drawing!